"Fresh salmon with butter and herbs melts in your mouth; it's truly the best. Serve it with wild rice pilaf and fresh string beans." Preheat the oven's broiler and set the oven rack about 6 inches from the heat source. Line a jelly roll pan with aluminum foil, and spray with nonstick spray. Place garlic and olive oil in a small microwave safe bowl and cook on High for 1 1/2 minutes. Melt the butter in a saucepan over low heat, and stir in the garlic mixture. Remove from heat; stir in the Worcestershire sauce, lemon juice, white wine, black pepper, garlic salt, and fines herbs. Place the salmon fillets skin-side down on the prepared pan. Spoon about 1/3 of the butter sauce over the fillets, and sprinkle evenly with the fresh dill. Broil in the preheated oven for 3 minutes. Turn salmon fillets so that the side of the fillet faces up, and baste fillets with about 1/3 of the butter sauce; broil for 3 minutes. Turn the fillets to place the opposite side facing up; spoon on the remaining butter sauce; broil until the fish flakes easily with a fork, about 3 additional minutes. 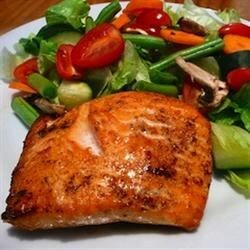 See how to make delicious salmon broiled with a butter and herb sauce.